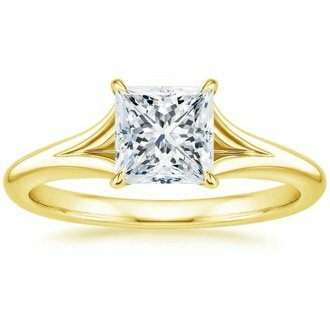 Princess Cut vs. 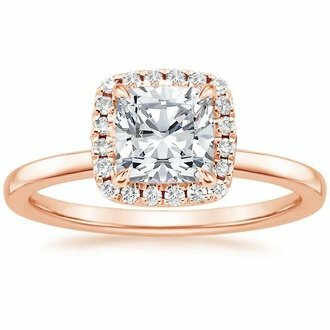 Cushion Cut: How to Decide? 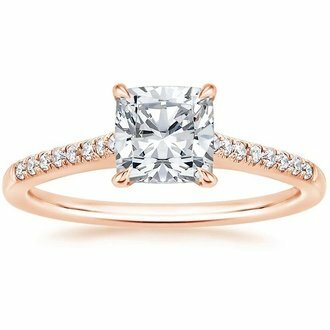 When it comes to creating your engagement ring, typically one of the first priorities is selecting a center diamond shape. 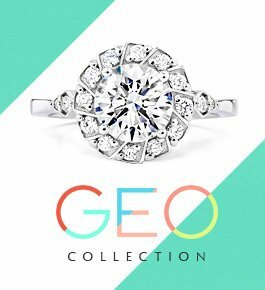 While round diamonds are always a popular choice, couples are increasingly turning to non-round or “fancy shaped” diamonds to add an element of distinction to their engagement ring. 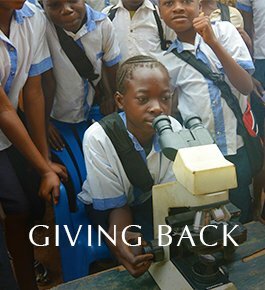 Each diamond shape has its own unique characteristics and is cut to different specifications, which impacts the overall look of the stone. Cushion diamonds and princess diamonds are two of the most well-known fancy shapes. 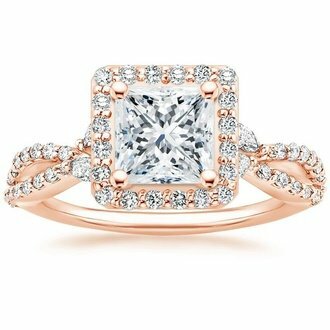 Although princess cut and cushion cut diamonds both offer a square center focal point to engagement ring settings, the two are very different. Cushion cut diamonds feature soft, rounded edges which lend to a more romantic feel. In contrast to the understated romance of a cushion cut, princess cut diamonds offer a more modern and geometric look to engagement ring settings. 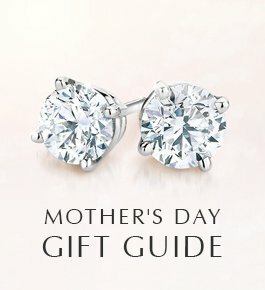 When it comes to deciding between cushion cut vs. princess cut, it call comes down to personal preference as both diamond shapes look uniquely gorgeous in many engagement ring settings. The cushion diamond is a square shape with softly rounded corners that make it subtly resemble a pillow (hence the name). 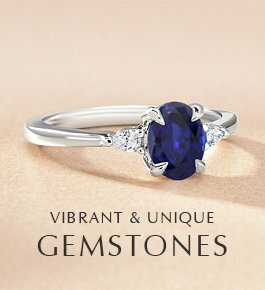 This timeless gemstone shape originated in the nineteenth century and was originally referred to as the “mine cut” diamond. 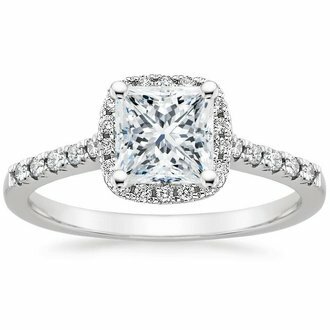 The proportions of a cushion cut can vary with the individual diamond, some appearing more long and narrow, others closer to square. 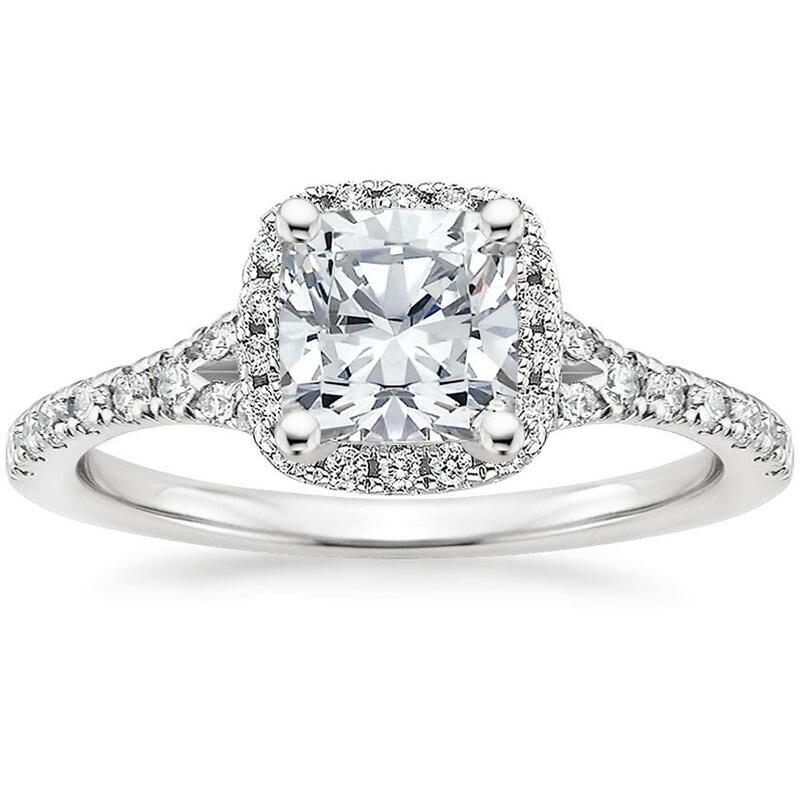 Cushion cut engagement rings are sought after due to their enduring sophistication. 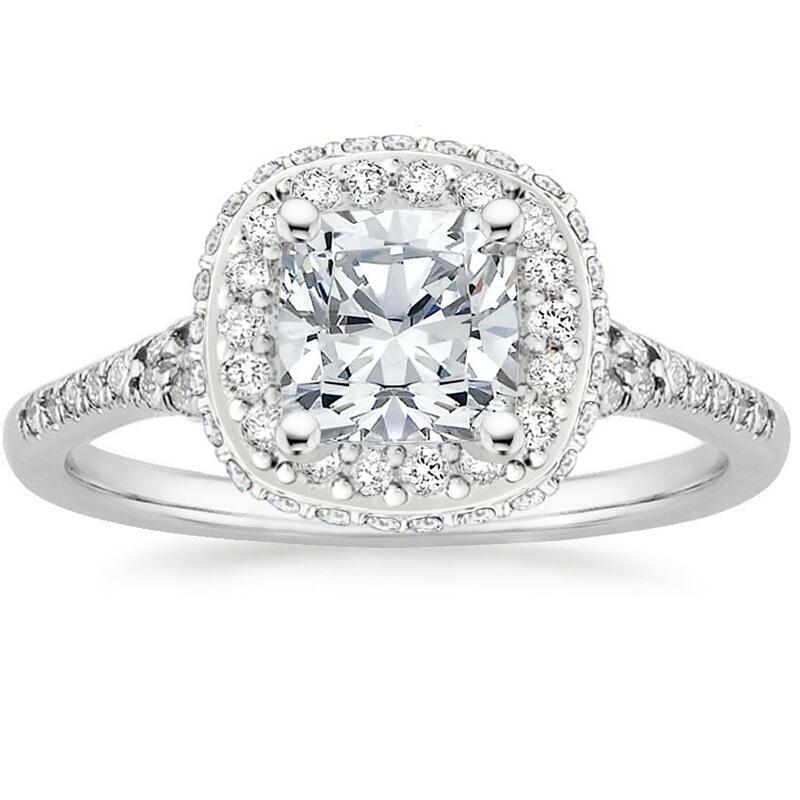 Especially popular in halo rings and vintage inspired settings, a cushion cut center diamond is an elegant choice. A glittering softened halo of diamonds surrounds the center cushion diamond in this elegant setting. A scalloped pavé split-shank band adds a stylish, dazzling effect. This enchanting halo ring features a strand of diamonds entwined with a high polished ribbon of precious metal for a captivating, nature-inspired look. This lavish setting is adorned with shimmering diamonds along every angle. Two rows of pavé diamonds sparkle on the contemporary split shank shoulders, while surprise diamond accents in the gallery complete the glamorous look. This beautiful setting features scalloped pavé diamonds that rise up the gallery and encircle the center cushion cut diamond in a halo of luminous sparkle. 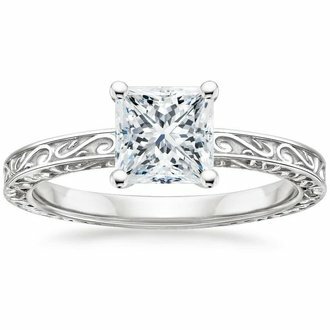 Scalloped pavé diamonds embellish the top of the band and gallery in this classically beautiful engagement ring. The shoulders rise to a cathedral setting and showcase a center cushion diamond secured by chic claw prongs. This classic engagement ring features sparkling scalloped pavé diamonds that extend one half of the way around the ring. 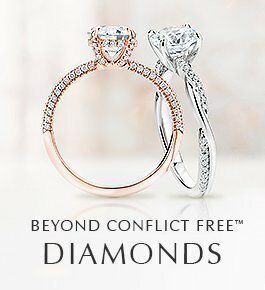 The center cushion diamond appears to float above the delicate band. 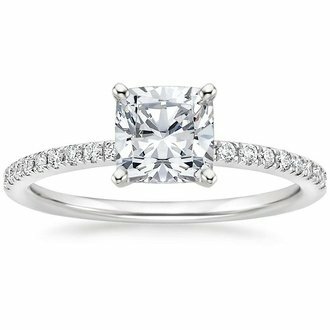 Invented by Arpad Nagy in the early 1960’s, the “princess cut” was originally called the “profile cut”. For many years princess cuts were considered the second most popular diamond shape, and have been compared to round brilliant diamonds so often that they are sometimes referred to as “square modified brilliants”. 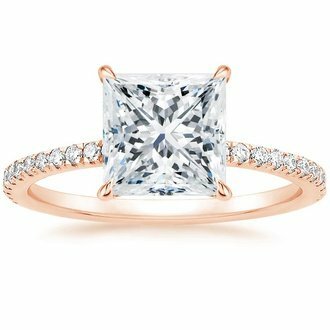 Princess cut engagement rings are sparkling, modern, and glamorous all rolled into one, making it the perfect cut for those who want it all. Possessing the sparkle of round brilliant diamonds in a chic square shape, princess cuts definitely make a statement. 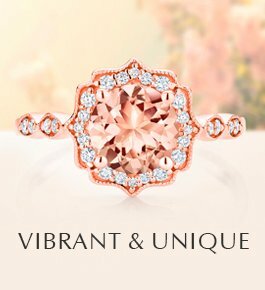 Whether set in a solitaire or three stone settings, these gems dazzle and bring a modern allure any engagement ring style. This exquisite antique-style setting is adorned with an engraved scroll pattern on the top and sides, flowing around the band for a charming and romantic look. At once feminine and contemporary, this ring divides into graceful ribbons of precious metal that intertwine and embrace the center princess cut diamond, securing it with claw prongs. 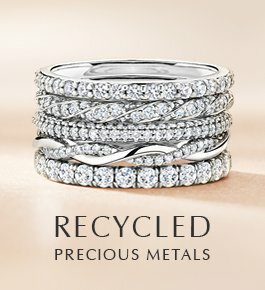 A nature-inspired twist on the classic three stone ring, this design features entwined vines shimmering with pavé diamonds. 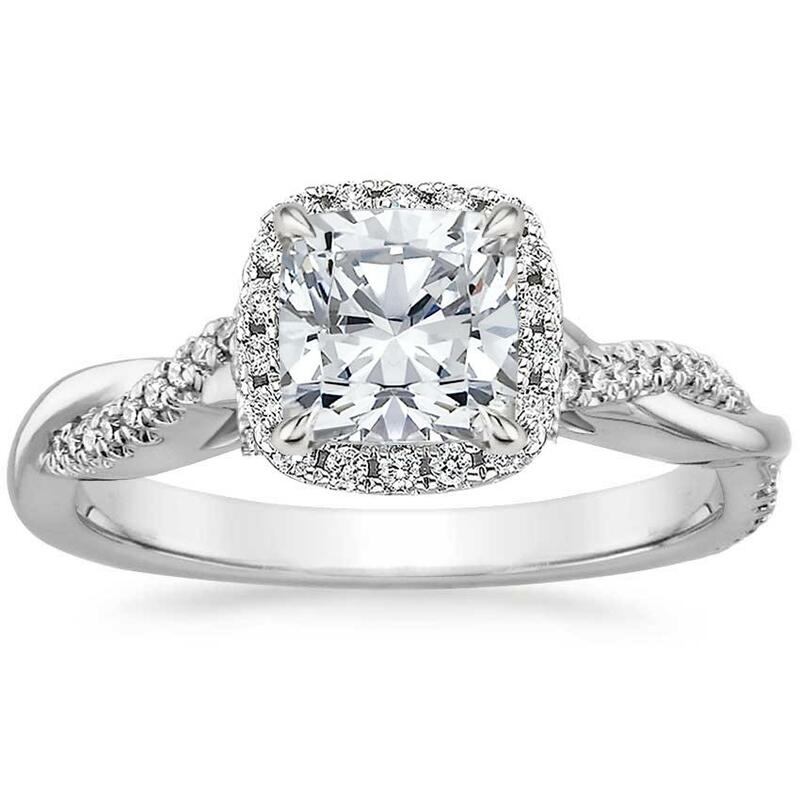 An intricate halo of pavé-set diamonds embraces and accentuates the center princess diamond in this brilliant ring. 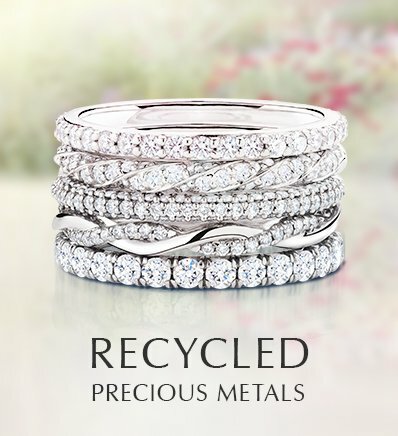 French pavé diamond accents on the band add a truly dazzling effect. This classic engagement ring features sparkling scalloped pavé diamonds that extend three-fourths of the way around the ring. 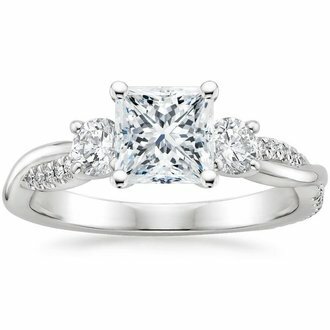 A diamond adorned gallery and graceful claw prongs embrace the center princess cut diamond. 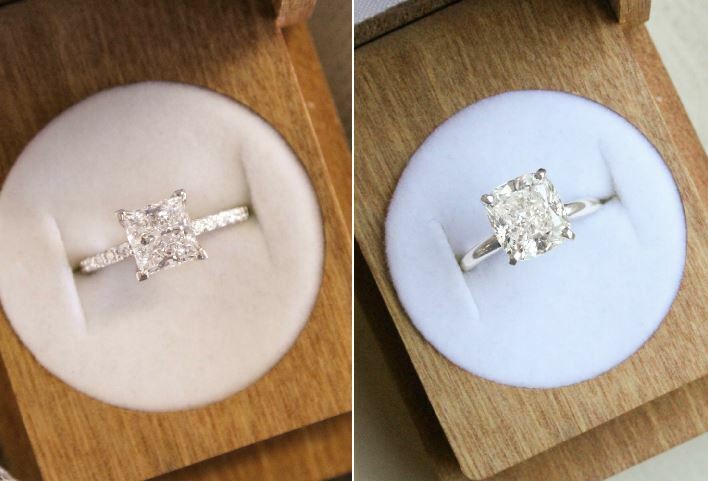 When it comes to princess cut vs. cushion cut, which do you prefer? Let us know in the comments below or on our Instagram, Facebook, or Twitter!